Thevery worn upper part, and fragment of the spring, of an Iron Age to Roman copper-alloy Langton Down brooch. An Iron Age to Roman copper-alloy Langton Down brooch comprising the head, with a semi-cylindrical spring housing and a fragment of the spring. 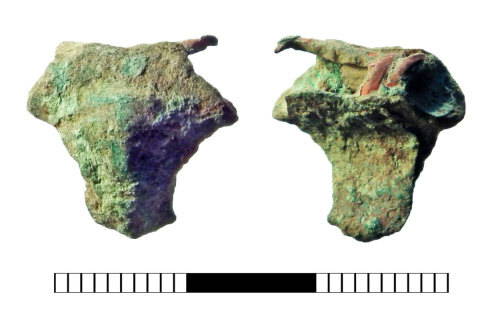 A copper-alloy Langton Down brooch fragment. Only the spring cover and part of the upper bow now survives. A fragment comprising the upper part of an Iron Age to Roman Langton Down brooch.